PORT-AU-PRINCE, Haiti - At least two Americans, one of them a young aid worker related to a retired senior U.S. naval officer, are believed to be among those trapped in wreckage after Haiti's earthquake. The executive director of Haitian Ministries for the Diocese of Norwich, Conn., Emily Smack, says she believes two of the organization's staff are trapped in their mission house. The house partially collapsed during the earthquake Tuesday. Smack identified the staffers as the mission's acting director, Jillian Thorp, and a management consultant, Charles Dietsch, who has been working with the ministry. Thorp is the daughter-in-law of retired Rear Adm. Frank Thorp, who retired in August as the Navy's chief information officer. Contacted at his home Tuesday night, Frank Thorp said he had been told that his 24-year-old daughter-in-law had tried to call for help using her cell phone and that her leg was badly injured. He said Jillian had been living in Haiti since August when she took the lead at the mission house, which works with orphans and children with HIV. Before moving there, Jillian had traveled to Haiti several times with her family to participate in humanitarian work, he said. "She's a superstar," he said of Jillian's devotion to aid work. The powerful quake was felt in southeastern Cuba, about 160 miles from the epicenter. Cuban authorities evacuated coastal residents because of the initial tsunami threat. "I was seated on the terrace and I thought my chair had slid out from under me but I realized it was an earthquake," said Eduardo Machin, a resident of the coastal city of Santiago de Cuba. "It was very strong." Sailors at the U.S. naval base at Guantanamo Bay in eastern Cuba felt the quake but there was no damage to the base or the detention camp where the United States holds 198 foreign terrorism suspects, said Chief Petty Officer Bill Mesta. USGS geophysicist Kristin Marano called it the strongest earthquake since 1770 in what is now Haiti. In 1946, a magnitude-8.1 quake struck the Dominican Republic and also shook Haiti, producing a tsunami that killed 1,790 people. The temblor appeared to have occurred along a strike-slip fault, where one side of a vertical fault slips horizontally past the other, said earthquake expert Tom Jordan at the University of Southern California. 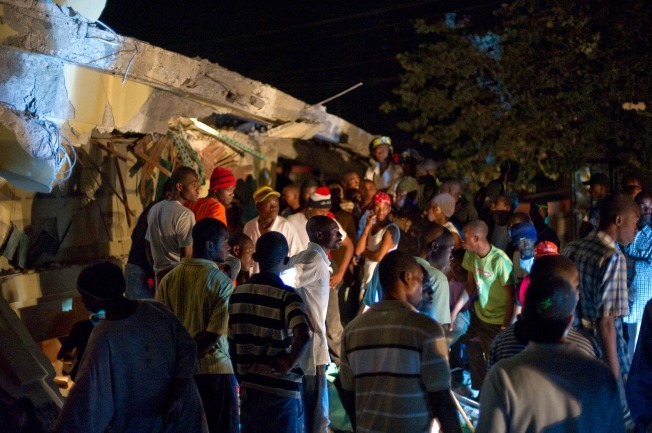 The earthquake's size and proximity to populated Port-au-Prince likely caused widespread casualties and structural damage, he said. Haitian musician Wyclef Jean urged his fans to donate to earthquake relief efforts, saying he had received text messages from his homeland reporting that many people had died. "We must think ahead for the aftershock, the people will need food, medicine, shelter, etc.," Jean said on his Web site. Marie Michel, a nurse from New York, was in Montagne Noir, a mountain suburb south of Port-au-Prince, for a funeral.